We discovered Tadelakt twenty years ago in Morocco where we lived for many years. We learned this ancient technique from skilled Moroccan Mahlems (artists) and became Tadelakt Artists. For nearly ten years, we applied this marvelous art in Morocco's prestigious palaces and residences from upscale resorts in Marrakesh and Agadir, to historic riads and the Hassan II Mosque, the largest Mosque in the world. Tadelakt has existed since the middle ages. It was created by the Romans and was originally used to waterproof cisterns which were used to collect drinking water and later on it was used in Hammams, or oriental steam baths. 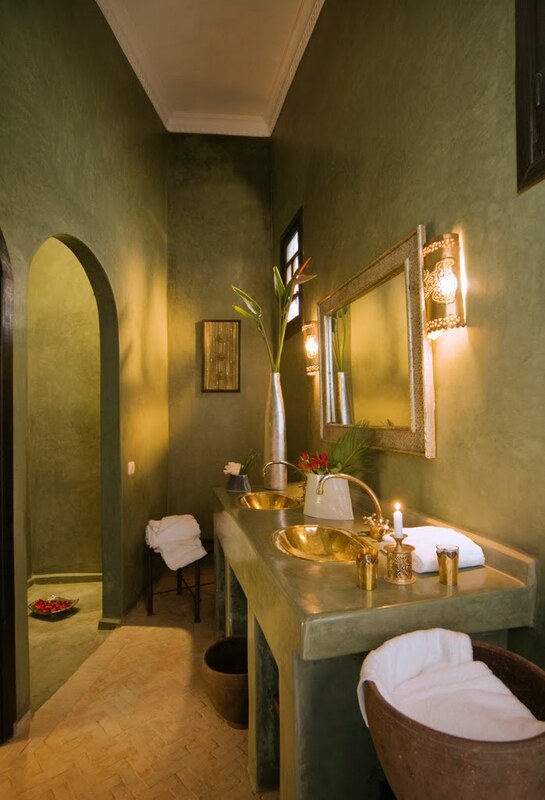 Tadelakt is a Moroccan wall treatment that combines lime sand, and natural colorings. It is polished to a high sheen by rubbing for hours with smooth stones and hand soap. Traditionally the Tadelakt technique was applied by Berbers who passed on their knowledge from generation to generation. Workers in Tadelakt are respected in Morocco for their technical and artistic skills. Tadelakt is known as the Stucco Lustro in the Italian tradition of elegant luxurious wall finishes. It is a real pleasure for those who love natural smoothness and is addictive. Its smooth and luminous surface exudes a hard to describe fascination which almost nobody can escape. The way tme material is applied produces a fascinating slightly wavy, living, shiny surface. The color tone of Tadelakt is not regular like in normal pigmented render, but depends on the application. Where the material is a bit compressed, a darker color tone will result. The surface of Tadelakt seems to change in color tones depending on the lighting conditions. Over the years it becomes veined and develops fine cracks, like marble. Today, in Interior Design the popularity of Tadelakt is reaching its height. Foreign designers order Tadelakt to be made in their own color and shapes and use it on walls, in tables, fireplaces� The color palette was initially inspired by the colors found in the country�s infinite variety of wildflowers. Tadelakt walls in oxblood, rust, gray, tan, ochre and yellow are especially popular in Marrakesh . In the late 70�s, the American Designer Bill Willis, from Mississipi, rethought the use of Tadelakt when he restored his own property in Marrakesh , Morocco. His design introduced contemporary adaptations of traditional Tadelakt. It ranges in color from dark mahogany brown to subtle buff, from striking red to subtle earth tones, or brilliant saffron. Moroccans have relied on the decoration of walls, ceilings, and floors to �furnish� a house. Incorporating this historic Moroccan render in your Interior Design Project gives the ability to create a fresh and sophisticated mix of Hispano-Moorish and Western design. Applying Tadelakt to walls lends a dramatic dimension to a room. It is an exhilarating combination of vivid sensuality and intense spirituality. T adelakt is known as the Stucco Lustro in the Italian tradition of elegant luxurious wall finishes. It is a real pleasure for those who love natural smoothness and is addictive. Its smooth and luminous surface exudes a hard to describe fascination which almost nobody can escape. The way the material is applied produces a fascinating slightly wavy, living, shiny surface. The color tone of Tadelakt is not regular like in normal pigmented render, but depends on the application. Where the material is a bit compressed, a darker color tone will result. The surface of Tadelakt seems to change in color tones depending on the lighting conditions. Over the years it becomes veined and develops fine cracks, like marble.